Shambhala at Byron is a place that has been echoed to me for years. It’s a beautiful, faithful haunt of Byron Bay, located on Belongil Beach and a short walk away from the fabulous Treehouse restaurant. By now you’ve probably caught on that Pra has a soft spot for all things Byron Bay. It’s one of the prettiest places on earth, with sacred roots that stem from the deep connection to the Arakwal Bumberlin, the local indigenous group that goes back at least 22,000 years. Yep, you read that right—that number isn’t a typo! Byron Bay creates a bubble of hippy happiness (even if it’s becoming a bit more commercialised as people like us continue to write about it). Trade in your new pair of heels for thongs and cut-offs, throw your hair back into a messy ponytail instead of carefully styled curls, and get back to what’s real. Because that’s exactly the vibe you’ll experience at Shambhala. The Shambhala property was bought, grown, and developed over time with love by Joanna James and her family. They’ve worked tirelessly to create a zen haven with four cottages that each offer their own individuality and delightful surprises. And zen it is. The name Shambhala means “pure land” or “mythical hidden kingdom” in Buddhism and I have to say, it’s an incredibly apt name for this hidden beach retreat. Shambhala at Byron is literally right on the Belongil Beach. 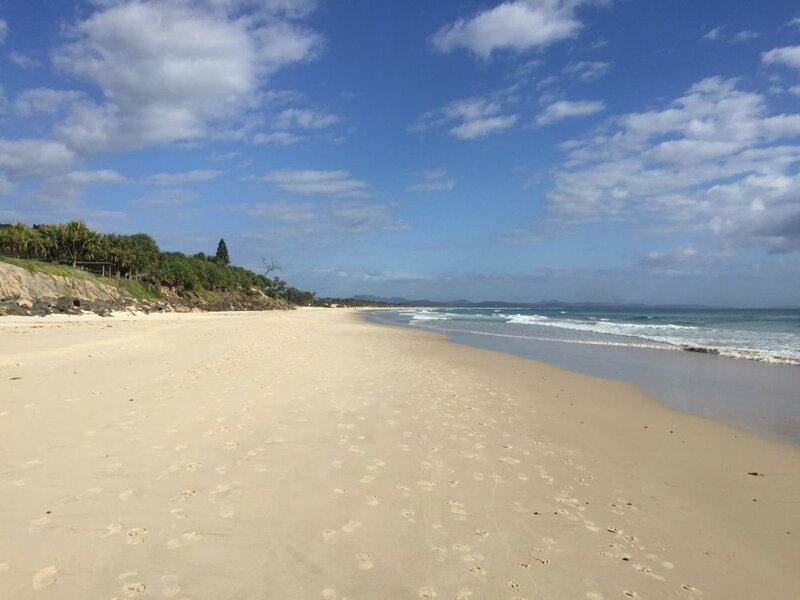 Staying here means you’re just steps away from a gorgeous stretch of pristine white sand that has somehow dodged being on the mainstream radar of Byron Bay tourists. And yet, you’re still only a short walk away from the liveliness of Byron if you do want to immerse yourself in that for a little bit. Step away from the hustle and bustle, drive down a sandy track, and you’ll soon see Shambhala’s beautifully carved wooden doors. When you walk through those big doors, an almighty amethyst crystal greets you, as though signalling the beginning of your spiritual and cleansing stay. A wooden walkway flanked by large, white pebbles leads you further into the lush, green property that is peppered with buddhas. It’s like entering a secret garden. Don’t expect the typical hotel vibe here. Shambhala is structured around fully equipped Balinese-style cottages that are more focused on making sure you feel peaceful, relaxed, and at home. The decor isn’t necessarily the most up-to-date (which is a bit of a shame) but the cottages are still fresh and beautifully looked after and you’ll no doubt feel like you’re in your own little private paradise. The Samadhi Retreat is armed with a delightful jacuzzi while the Shanti Retreat has a gorgeous deck that looks out to the ocean and the cutest cabana. Meanwhile, over at the Shiva Retreat, you’ll be treated to a huge terrace across the road that feels like an exclusive garden that backs up onto the river. Here, you can nestle into the chairs on the most glorious wooden terrace to unwind and relax. 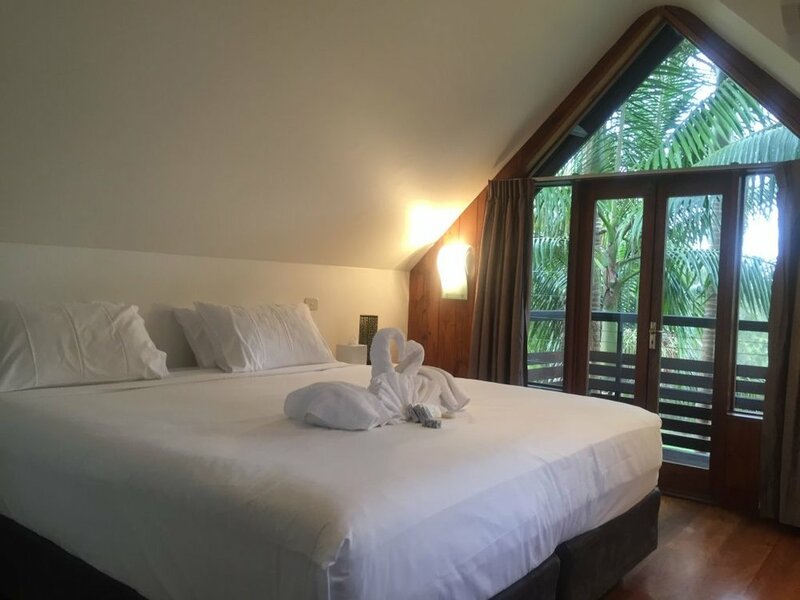 We stayed in the Sarita Cottage which is ideal for a girls’ bonding session. There was a superb kitchen kitted out with Bosch equipment, a fridge and freezer, a lounge, and an 8-seater table. Downstairs was a single bedroom and a rainfall shower and upstairs had a beautiful master bedroom and another twin bedroom. There was also a jacuzzi and an outdoor shower for those who really want to embrace the au naturel way of life! To top it all off, we were greeted with beautiful complimentary organic wine and bubbles, incense, crystals to take home, plus all the amenities you could wish for in a paradise retreat, including Japanese-esque dressing gowns. This entire place is one, big, super chill bubble where you can escape from the world. Do some yoga, take a walk (or run) along the beach, curl up in the garden with that book you’ve been trying to find the time to read for the last 5 months, cook up a feast and invite some friends to enjoy dinner al fresco on the sun deck. Whatever you want. They’ve provided the setting and it’s up to you to decide how you want to make use of it! Shambhala at Byron is the perfect answer for those looking for a few days of chilling without the froufiness of being in a hotel. Don’t get me wrong, I love a good hotel but sometimes you just need something simpler, cleaner, and clearer and this is where you’ll find that!